Hello readers! I am here to share one more book review. Yeah! Voices of the Silent Creek is a catchy title, suits to the content. Title indicates that book wants to convey something unspoken yet! Title itself says so much about theme and dark picture of society. The book cover is also attractive, A woman’s sketch sitting under a tree and around trees in jungle has sad emotions. We can observe many faces in background on cover. Shanti is married in a prominent family but her life will never be the same for a life thrusted on her for honor of the family. She accepts her life but will she let the same fate unfold for her younger sister? The story set in rural India takes us through unimaginable yet common atrocities which a woman faces in today’s society. Will they fail to survive? Will they emerge stronger battling the troubles? Vikkas Arun Pareeek is working for a major Indian IT company and is based in London. Voices of the Silent Creek is his first self published book. He has a passion of writing and is venturing into a vast and respected arena of expressing and writing books. You can reach out to him on vapbooksfeedback@gmail.com and Twitter @vapmail16. Theme:- The theme of Voices of the Silent Creek is based upon social issues and women’s assault, disbelief and betrayal in different relations. In short, we can categorize this novel as a tragedy in women’s life. Locations:- The story of Voices of the Silent Creek runs around Bardolia village and we can see references to Melbourne (Australia) in few incidents. Language:- Author Vikkas Arun Pareek uses simple language in novel. A Voices of the Silent Creek is the debut work of author, but he uses literary and grammatical elements elegantly. Though author is based in London (UK), he didn’t forget Indianness; We can see several Hindi and other Indian words and proverbs in the book. Italic font is used properly. Words in capital letters indicate strong emotions. Appendixes attached at the end of book are plus point of book. I liked few linguistic experiments made by author; I mean use of riddle “uoorr eilps rar foft h noose.” means “your lips are soft as rose petals.” and English translations of abusive language. Author’s Writing Style:- Author Vikkas Arun Pareek ji uses descriptive style of writing to narrate the story of Voices of the Silent Creek. One can see proper words selection by the author. He uses abusive words but no one will call those words unnecessary in such incidents, so the use of abusive language is noteworthy. Shanti:- Author sketches Shanti as a central character in book. He introduces her as a Princess of the farm who is very simple girl and becomes a victim of relations betrayal. Bhano:- Bhano is the name of Shanti’s sister. Author portrays her character as an aware, a courageous and a brave girl. Arti Khandelwal:- Author portrays Arti’s character as another protagonist. She is from educated and modern family, she is very clever and helpful. Mano:- She is Shanti’s sister-in-law (Jethani) and parshuram’s wife. She is another victim of domestic assault, she is sympathetic for Shanti who becomes mad later. Mamta:- She is Mohanlal’s to be wife. Sarita:- She is a twelve years old girl. Laxmi:- She is a wife of Manohar. Arya:- She is a daughter of Arti and Amol. Bheem Singh:- He is the father-in-law of Shanti and also a Sarpanch of village. Author portrays his character as a villain in story; who shows to be a good and respected human being but he is very cruel person like evil. Parshuram:- He is the elder son of Bheem Singh. He is an another villain in the book. Mohanlal:- He is the husband of Shanti. Krishna:- Krishna is younger brother-in-law (Devar) of Shanti and a boyfriend of Bhano. Amol:- He is a teacher and boyfriend of Arti. Ramgopal:- He is a father of Shanti and Bhano. Manohar:- He is a brother of Shanti and Bhano. Sujay Mathur:- He is the father of Amol and father-in-law of Arti. Ravi:- He is a minor character in the book and is Arti’s friend. Surya:- He is a biological son of Shanti. Arya:- He is a son of Bhano and Krishna who born in a prison. The story of Voices of the Silent Creek is described into 20 chapters. I felt first 6 chapters quite boring as they are described in slow pace but those are not less important. Whole book is a page turner from 7th chapter as it is written in fast pace. Readers may take some time to relate the story while reading introductory chapters. Voices of the Silent Creek is mainly Shanti’s story. It shows glimpses of physical and sexual problems in women’s life. The theme is based upon Shanti’s tragic married life, sufferings and tolerance. Author shows how people helping victims have to suffer from another tragedy in their own life through the character of Arti and Amol. Author sarcastically comments on problems people have to face because of alphabetical order according to name; in that case I feel myself lucky as my name Rajesh starts with middle alphabet ‘R’. Voices of the Silent Creek is the story of Shanti’s younger sister Bhano’s married life and betrayal by her boyfriend Krishna in love and live in relationship. Arti’s efforts for justice instead of grieving are remarkable. Her character inspires readers to fight against harmony without any kind of fear and worry of defeat or loss. Though the plot of Voices of the Silent Creek is tragic. Author surprises readers with few romantic scenes between Arti and Amol and Shanti with her husband Mohanlal. He describes few intimate and assault scenes in book openly, though those scenes look obscene, I would show them green light because obscenity was required in those scenes. Author Vikkas Arun Pareek comments on social like girl feticides, but at the same time he urges to save girl children when Amol says “I want to able play with my daughter.” I appreciate author’s massage to save girl child but Amol’s dislike for a boy to Arti in his sentence “I will divorce if you deliver a son” can never be appreciated. I know that author’s intention is not against boys or he doesn’t mean that but I think authors should think before writing a single sentence that negative massage shall not go from their writing. Author criticizes on inactive and insensitive people in his quote “She cried for help but no one came. There were those who were not able to move due to shock, there were those who did not have courage to move and then there were those, who were silently enjoying the show.” He also comments on police’s inactive reaction on Bhano’s complaint against Sarpanch Bheem Singh and his son Parshuram. He writes about the fact, how Non-Government Organization (NGOs) works better than police as usual. 1. Chapattis = Chapati (alternately Chapatti, Chappati or Chappathi) is an unleavened flatbread (also known as roti) from Sri Lanka, India, Nepal, Bangladesh and Pakistan. It is a common staple in South Asia as well as amongst South Asian expatriates throughout the world. Dupatta = A length of material worn arranged in two folds over the chest and thrown back around the shoulders, typically with a salwar kameez, by women from South Asia. Ji = JῙ is an honorific used as a suffix in Hindustani and many other languages of the Indian subcontinent. Laado (Laadoo/Laddoo) = An Indian sweet made from a mixture of flour, sugar, and shortening, which is shaped into a ball. Pallu = Aanchal is the Hindi word for a piece of cloth worn by females on the upper part of body. It can be a dupatta (something like a scarf) or the loose end of a sari or some similar kind of dress. Pallu is mostly used for the part of sari only, rather than a dupatta. Pani Puri = Pani Puri is a street snack from the Magadha region of India. It consists of a round, hollow puri, fried crisp and filled with a mixture of flavored water (“pani”), tamarind chutney, chilli, chaat masala, potato, onion and chickpeas. Sarpanch = A sarpanch is an elected head of village-level statutory institution of local self-government called the panchayat. Few italic fonts are used at unnecessary places. Print Mistakes and Typing Errors:- Though there are not too many print mistakes, I found two; ‘then’ and ‘checks’ are printed instead of ‘than’ and ‘cheeks’ on page no. 29 and 169 respectively. (i.e ‘fairer then than her’ and Arti said her face covered with her hands and tears rolling down her checks cheeks.) Third typing error is about wrong use of apostrophe mark on page no. 108, mistress’s instead of mistress’ and punctuation marks are missing is some paragraphs. Currency symbol US Dollar ($) and Pound (£) are printed next to the figure (i.e 9.99$ and 6.99£) instead of $9.99 and £6.99 as book price on back cover. And now please do not count my grammatical mistakes in this blog post, you will be tired but my mistakes will not be counted! I am working on my language. “Author Vikkas Arun Pareek deserves round of applauds to write fearlessly about women’s assaults in rich families in villages. He tackled an uneasy and sensitive subject in Voices of the Silent Creek elegantly. Author tried to give voices to the women living in silent creeks around rural India as book title suggests. Though story is fictitious it seems realistic. 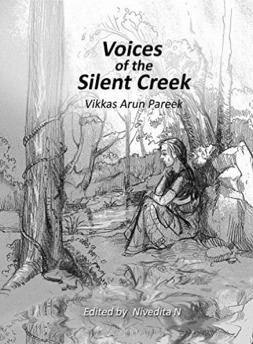 I would give 4.35 out of 5 stars to the book Voices of the Silent Creek by Vikkas Arun Pareek. This is my personal analysis of Voices of the Silent Creek by Vikkas Arun Pareek and your feedback may be vary. The book Voices of the Creek was sent to me by Santhosh through Amazon.in on the request of author Vikkas Arun Pareek ji for the purpose of an honest review. Very perfect review Sir! Well done. ‘Voices of the silent creek’ by Vikkas Arun Pareek is a very realistic novel as a tragedy of women’s life. Your review about this book is perfect, especially the way you spotted out the abusive words used by the author and still called them ‘noteworthy’ in a different aspect, is very impressive. The theme of the novel is very touching indeed. Your 4.35 rating is perfect. Good work Sir.